This was a very spontaneous project! After rearranging a few things in my living-room (I got tired of looking at the same pictures 😊 ) I needed something pretty and unique for an empty spot on one of the walls. Now, I’ve done a few weavings, created an oversized ‘Tree-0f-life’, and a dreamcatcher. All wonderful, and I enjoy them every day – but also very time consuming. And I wanted something NOW! Lightbulb moment! 🤗 Needle felting on a handy, right there surface! An old sweater I had felted for a project (that never happened ☺️ ) came to mind. 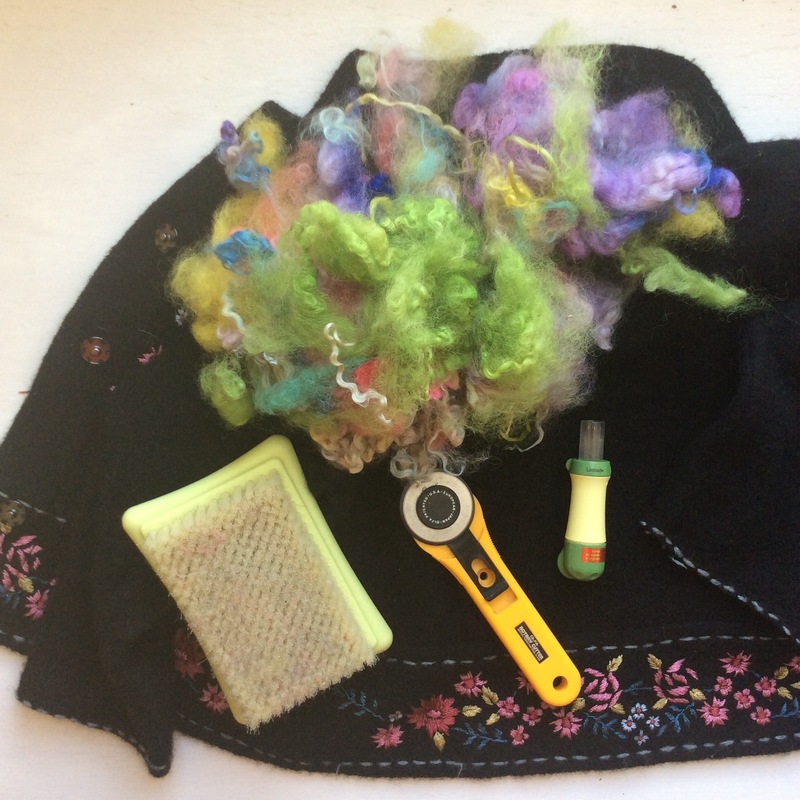 A felted sweater (the pretty border is a bonus, but not necessary), a rotary cutter (fabric scissors work too), needle felting tool and -mat, and wool fluff. Later on (after this picture was taken) I realized you’ll need a sewing needle and thread for the hanging sleeve. But that really is it. Cut the sweater into an even rectangle, or a square. Since the felting tangles the fiber there is no need to hem the edges 🤗 How cool is that? Now lay out the wool fluff and start punching with your felting tool. It’s also a great stress release! I love all the bright colors – but I’m already planning on making another one in green and red – Poppies! If you’re new to needle felting, here’s a tip: Remember – nothing is permanent! Isn’t that a relief. If you punch each ‘cloud’ only 2, 3 times, and decide later on that you don’t like the arrangement, you can pull off the piece and start over. Once you love your creation, punch every ‘cloud’ a few more times, and you’re set! Alrighty – felting is done! Pretty nifty, huh? And it really only took a little over an hour! All you need now to hang your beauty is a sleeve on the back. I cut a 2″ strip from one of the sweater leftover pieces, and pinned it to the back. You can (hand) sew it in place now, creating a sleeve for a curtain rod. Since the piece is not very heavy, a simple running stitch (1/4″) will do. If you like this idea, and need help – let me know! I’ll be happy to walk you through! And now you’re really done 😍 Didn’t take that long, did it? Enjoy your creation – I’d be thrilled to see the pics!